Java supports class reuse through inheritance and composition. In this two-part miniseries we'll focus on inheritance, one of the fundamental concepts of object-oriented programming. First, you'll learn how to use the extends keyword to derive a child class from a parent class, invoke parent class constructors and methods, and override methods. Then, in Part 2, we'll tour java.lang.Object and its methods. Object is Java's ultimate superclass, from which every other class inherits. To complete your learning about inheritance, be sure to check out the Java 101 composition and inheritance primer. You'll learn why composition is an important complement to inheritance, and how to use it to guard against issues with encapsulation in your Java programs. Source code for "Java 101: Inheritance in Java, Part 1." Created by Jeff Friesen for JavaWorld. Inheritance is a programming construct that software developers use to establish is-a relationships between categories. Inheritance enables us to derive more-specific categories from more-generic ones. The more-specific category is a kind of the more-generic category. For example, a checking account is a kind of account in which you can make deposits and withdrawals. Similarly, a truck is a kind of vehicle used for hauling large items. Inheritance can descend through multiple levels, leading to ever-more-specific categories. 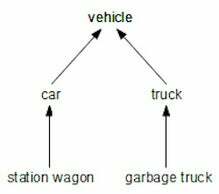 As an example, Figure 1 shows car and truck inheriting from vehicle; station wagon inheriting from car; and garbage truck inheriting from truck. Arrows point from more-specific "child" categories (lower down) to less-specific "parent" categories (higher up). This example illustrates single inheritance in which a child category inherits state and behaviors from one immediate parent category. In contrast, multiple inheritance enables a child category to inherit state and behaviors from two or more immediate parent categories. The hierarchy in Figure 2 illustrates multiple inheritance. When viewing an inheritance hierarchy, you can easily detect multiple inheritance by the presence of a diamond pattern. Figure 2 shows this pattern in the context of vehicle, land vehicle, water vehicle, and hovercraft. Categories are described by classes. Java supports single inheritance through class extension, in which one class directly inherits accessible fields and methods from another class by extending that class. Java doesn't support multiple inheritance through class extension, however. The extends keyword is specified after the class name and before another class name. The class name before extends identifies the child and the class name after extends identifies the parent. It's impossible to specify multiple class names after extends because Java doesn't support class-based multiple inheritance. These examples codify is-a relationships: Car is a specialized Vehicle and SavingsAccount is a specialized Account. Vehicle and Account are known as base classes, parent classes, or superclasses. Car and SavingsAccount are known as derived classes, child classes, or subclasses. You might declare a class that should not be extended; for instance for security reasons. In Java, we use the final keyword to prevent some classes from being extended. Simply prefix a class header with final, as in final class Password. Given this declaration, the compiler will report an error if someone attempts to extend Password. Child classes inherit accessible fields and methods from their parent classes and other ancestors. They never inherit constructors, however. Instead, child classes declare their own constructors. Furthermore, they can declare their own fields and methods to differentiate them from their parents. Consider Listing 2. Listing 2 describes a generic bank account class that has a name and an initial amount, which are both set in the constructor. Also, it lets users make deposits. (You can make withdrawals by depositing negative amounts of money but we'll ignore this possibility.) Note that the account name must be set when an account is created. For Listing 2, I chose to represent a monetary value as a long integer, where the value is stored as a count of pennies. You might prefer to use a double or a float to store monetary values, but doing that can lead to inaccuracies. For a better solution, consider BigDecimal, which is part of Java's standard class library. Listing 3 presents a SavingsAccount child class that extends its Account parent class. The SavingsAccount class is trivial because it doesn't need to declare additional fields or methods. It does, however, declare a constructor that initializes the fields in its Account superclass. Initialization happens when Account's constructor is called via Java's super keyword, followed by a parenthesized argument list. Just as this() must be the first element in a constructor that calls another constructor in the same class, super() must be the first element in a constructor that calls a constructor in its superclass. If you break this rule the compiler will report an error. The compiler will also report an error if it detects a super() call in a method; only ever call super() in a constructor. Listing 4 further extends Account with a CheckingAccount class. CheckingAccount is a little more substantial than SavingsAccount because it declares a withdraw() method. Notice this method's calls to setAmount() and getAmount(), which CheckingAccount inherits from Account. You cannot directly access the amount field in Account because this field is declared private (see Listing 2). If super() is not specified in a subclass constructor, and if the superclass doesn't declare a no-argument constructor, then the compiler will report an error. This is because the subclass constructor must call a no-argument superclass constructor when super() isn't present. I've created an AccountDemo application class that lets you try out the Account class hierarchy. First take a look at AccountDemo's source code. A subclass can override (replace) an inherited method so that the subclass's version of the method is called instead. An overriding method must specify the same name, parameter list, and return type as the method being overridden. To demonstrate, I've declared a print() method in the Vehicle class below. Next, I override print() in the Truck class. Truck's print() method has the same name, return type, and parameter list as Vehicle's print() method. Note, too, that Truck's print() method first calls Vehicle's print() method by prefixing super. to the method name. It's often a good idea to execute the superclass logic first and then execute the subclass logic. In order to call a superclass method from the overriding subclass method, prefix the method's name with the reserved word super and the member access operator. Otherwise you will end up recursively calling the subclass's overriding method. In some cases a subclass will mask non-private superclass fields by declaring same-named fields. You can use super and the member access operator to access the non-private superclass fields. Occasionally you might need to declare a method that should not be overridden, for security or another reason. You can use the final keyword for this purpose. To prevent overriding, simply prefix a method header with final, as in final String getMake(). The compiler will then report an error if anyone attempts to override this method in a subclass. The modified Truck class now has two print() methods: the preceding explicitly-declared method and the method inherited from Vehicle. The void print(String owner) method doesn't override Vehicle's print() method. Instead, it overloads it.